21' Silver Streak Welded Aluminum Jet Boat in Action. 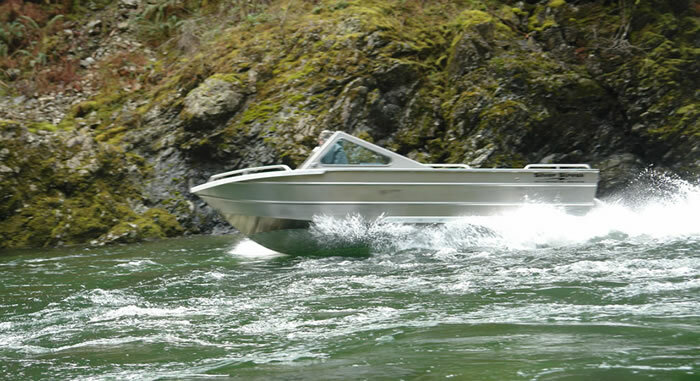 Silver Streak Boats is an aluminum boat builder based out of Sooke, BC on Vancouver Island's wild west coast. The first Silver Streak shop was opened back in 1987. The second location was the property of an old gas station only minutes from downtown Sooke. Silver Streak Boats, now in 2017, still runs out of this location only now with added shops, office space, a parts department and a crew of 30 employees and various contractor’s. There are several dealers that sell Silver Streak boats and with such a long time in production there is a very robust used market for these boats as well, with Vancouver Island being a good place to start your search. Silver Streak builds highly customizable welded aluminum jet boats in 16', 17', 18', 19', 20' and 21' sizes for a variety of uses.